G is abandoning me for the Microsoft BUILD conference starting on Sunday morning (for a whole week, ugh), so I’m <i>building</i> a list (ok, no more puns) of projects for me to tackle while he’s gone. Most of the new house stuff is beyond my understanding or talent (i.e. we’ve still got to get the ceiling put in), but our interim condo definitely needs some sprucing up. 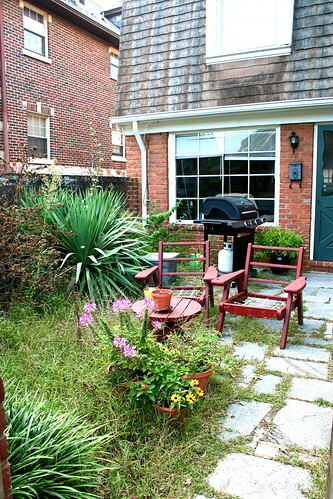 See this courtyard? Yeah, it needs work. We let it just do whatever it wanted to all summer, but now the giant weed-plant-things (no idea what they were) died back, the grass stuff is taking over, and it’s a generally unpleasant place to hang out. But with the cooler weather, I’d like to. So Sunday? Hopefully it’ll all be gone by that night. But before I clean anything or rip out dead plants or do anything remotely useful around here, how about some figs? Beautiful, ripe, fresh-from the farm-up-the-road figs? Figs have never attracted my palate, personally. They’re one of those fruits that I’ll eat if handed one, but will never pick out. But these looked so beautiful at market that I just had to snap up two pints worth. And am I glad I did. 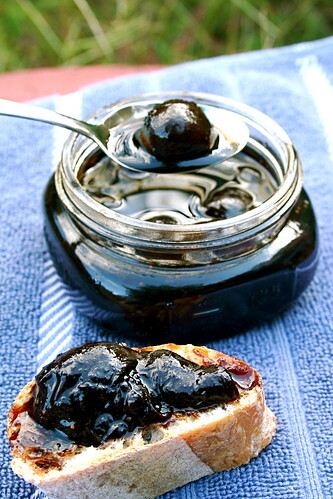 After googling around for a preserving recipe that I could get behind, I found Nina of Put Up or Shut Up!‘s recipe for Balsamic Pickled Figs and I fell in love with the idea. My main issue with figs is that they’re sticky and sweet–but even though balsamic vinegar is sweeter than an apple cider vinegar or a rice vinegar, it’s still got that bitey edge to temper the sweet sweet figs. I toyed with the recipe a bit depending on what I had on hand (one thing I did have was a gigantic bottle of balsamic vinegar from Sam’s (an impulse buy of the “but it’s so big I have to buy it” variety…bad move), and after leaving them be for a month and a half or so, I popped them open today. Yes, they’re sweet, but they’re also rich and almost smokey from the balsamic vinegar. The agave added back a bit of the honey sweetness the original recipe called for, but over all, the taste of the figs really shone through and complimented the balsamic. I didn’t add any nuts, but I can definitely see why the original used them, and the slight hint of rosemary was a nice addition. A pretty delicious start to the weekend, I must say! Bring a several cups of water to a boil. Prick each fig a couple of times with a fork. Place figs in a bowl and cover with the boiling water. Gently swish the figs around. Drain. Repeat if necessary to clean figs. Combine balsamic vinegar, water, agave, and sugar in a large nonreactive pot. Bring to a boil and simmer for 10 minutes. Carefully lower the figs into the simmering syrup. Simmer uncovered for twenty minutes. Continue simmering for another 10-25 minutes, depending on the size of your figs. The liquid should look slightly syrupy and the figs should be a little glossy. Arrange figs in sterilized, hot jars, dividing the herbs, peppercorns and zest evenly between them. With a ladle pour the syrup over the figs leaving 1/2 inch of headroom. Close and seal the jars . Process in a boiling water bath for 15 minutes. My batch produced 2 pints. I have never tried anything remotely resembling this preserve, however. Perhaps this should happen in the near future. Oh, now this is exciting! I share your ambivalent stance on figs, so this recipe sounds perfect for me. I’ll have to invest in some good balsamic now. I am a big figs fan, but sometimes I struggle with what to do with them. Figs and beets both, I have strong taste memories but just can’t figure out how I like them best. This looks like a great recipe — I love pickled all kinds of things! 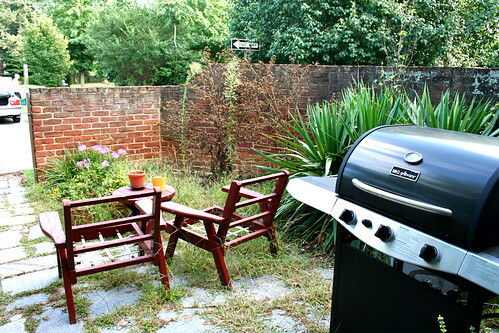 Good luck with the clean-up — it’ll be worth it on Sunday evening with a choice beer and nice seat. 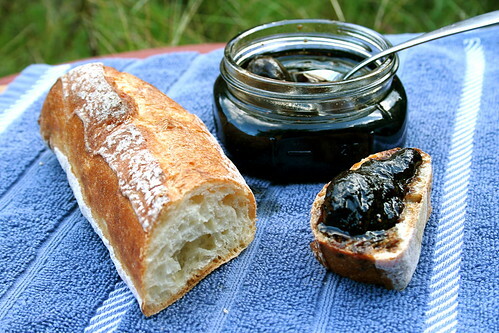 So I was considering fig preserves & I thought, hey, have you tried the fig & black pepper jam from Super Natural Cooking? It is SO AMAZING. Not just this past week, but the whole year seems to be flying by. 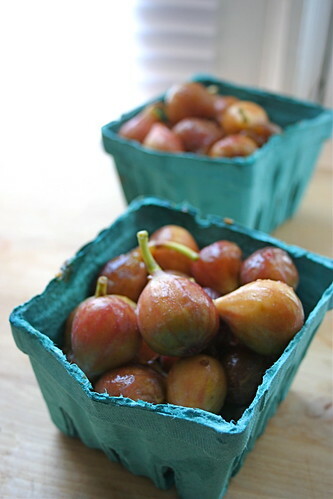 The preserved figs looks super yummy! I’m going to have to pick up some figs now. I always buy figs and then don’t eat them fast enough; now I know what to do with them before they go bad! Looks truly awesome! Yum! Now, if only they grew figs around here….